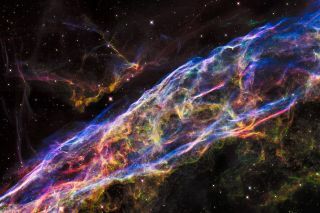 The Veil Nebula was observed by the NASA/ESA Hubble Space Telescope. Image released Sept. 24, 2015. "Astronomers suspect that before the Veil Nebula's source star exploded, it expelled a strong stellar wind. This wind blew a large cavity into the surrounding interstellar gas," officials with the European Space Agency (ESA), which operates Hubble jointly with NASA, said in a statement. The Veil supernova remnant and the surrounding sky appear in this image. "As the shock wave from the supernova expands outwards, it encounters the walls of this cavity — and forms the nebula's distinctive structures," they added. "Bright filaments are produced as the shock wave interacts with a relatively dense cavity wall, whilst fainter structures are generated by regions nearly devoid of material. The Veil Nebula's colorful appearance is generated by variations in the temperatures and densities of the chemical elements present." To see the Veil Nebula in 3D, use red-blue glasses. This stereo image of the Veil Nebula uses observations made by the NASA/ESA Hubble Space Telescope in 1997 and in 2015. Cross your eyes to see the 3D effect. The Hubble Space Telescope launched in April 1990. The observatory's initial images were blurry, and mission scientists soon discovered why — Hubble's 7.9-foot-wide (2.4 meters) primary mirror was slightly flawed. But astronauts fixed the problem in 1993, and Hubble began beaming to Earth the amazing, supersharp images it's famous for today. Four additional servicing missions between 1997 and 2009 further repaired and upgraded the observatory, which operators say should keep going strong through at least 2020.